"Just evolving the Go Fish to something new, really. The Go Fish goes fast and feels skatey and loose and I love it, and riding it for a couple years made me want to feel more high performance - more carves, tighter turns. So the Seaside is about refining… less area in the tail, narrowing the tips of the swallow, creating more curve and narrowing the nose. All elements for ripping while the Go Fish stays cruisey and fun." 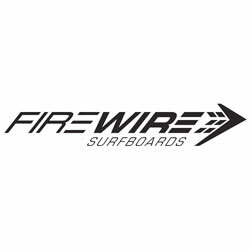 "The Firewire Seaside Helium Surfboard is quad only, why? I decided that if I was going to make a quad I would make a quad that’s strictly a quad ... Design the concaves and bottom contours around that. I actually redesigned the entire concave setup that I’ve been using on the Moonbeam and Go Fish, and did it with the quad setup in mind so that it all works together". "Why name this shape after your home break, Seaside? Naming surfboards might be the hardest thing to do on the plan-et [laughing]. It’s just the perfect little stick when I surf my home spot, Seaside." "Why is the Seaside built in Helium? The first one I made for Tahiti was LFT and I was riding it in 6-foot tubes. But most everyone surfs a shape like the Seaside at beach breaks and little point breaks, so we made it in Helium because it’s really light, very responsive, really flexy with a softer feel and very durable. It’s the best option for a shape like the Seaside in smaller, weaker waves, I think." FIN CONFIGURATION: Quad. Fins Not Included.